In February of 2015, India announced the plans to build 175GW of renewable energy. The goals are to gain energy from four renewable sources – 100GW solar, 60GW wind, 10GW bio-power and 5GW of small hydropower. As of September 1, 2017 22% of the 175GW of renewable energy had already been built (more than half of this coming from wind power). Annually, after 2017-18, the press release noted plans to auctions off 30GW in each of the fiscal years 2018-19 and 2019-20. This would mean total solar volume at 80GW for the years 2017-2020. Government data suggests about 14.7GW of solar was built as of September 30th. That would leave 5.3GW of solar power for the years 2020-21 – less volume than is planned to be bid in the month of February or March next year. The plans to bid wind projects were also laid out. 60GW of wind is planned in total before 2022 – with 32.7GW of it already commissioned. 8GW is planned for 2017-18 – with 10GW per year expected in 2018-19 and 2019-20. Bids in January and March are estimated to be 1.5-2GW each. India recently started a program to give solar panels plus batteries to all private households that had no electricity in a bid to electrify 100% of the population by the end of 2018. 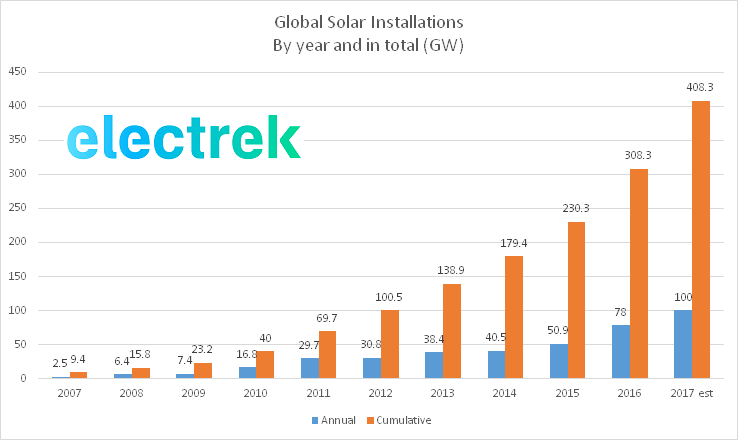 The average US residential installation is 0.0000053GW (5.3kW) – with the total volume installed for the USA in 2016 being 14.7GW. India is aiming to join China as a solar electricity superpower. China has already laid its stake in 2017 with probably greater than 50GW of solar power going in the ground. India sees this and sees an importance in trying to keep up with its neighbor. Truly, this clean energy rivalry might come to benefit the broader earth very much so. Part of the goal of this announcement is to create a domestic solar panel industry for 20GW/year of manufacturing capacity. Already in 2016, India led the globe in announcements for new solar panel manufacturing capacity. However – according to some reports – 85% of solar panels sold in the recent years as India has installed 14GW of solar have come from China. Much like in the USA, there have been many headlines talking about potential trade sanctions regarding solar panels from foreign entities. There is a definite geopolitical aspect to solar panel manufacturing that is catching the attention of heads of state around the world. Many of humanity’s recent military actions have involved oil. If our transition to electric cars and heating continues, it might be that we must still fight to keep the spice flowing, but instead of oil – it’s going to be electricity.